Last week Forbes published what has become its second annual clickbait attempt. It was clearly success and I’m upset with myself for continuing to give them attention, even if it’s negative attention. Trust me though, there’s a good reason I’m writing about this. Of course, I’m talking about how Forbes is labeling Kylie Jenner as the youngest self-made billionaire. I think most people look at “self-made billionaire” and laugh for reasons that I hope are obvious. Her sister, Kim Kardashian, and the whole family have been household names since 2007… and while I have never watched the TV show, I don’t think anyone credits the success of the family to ten year old Kylie. If Honey Boo Boo made the whole family tens and/or hundreds of millions of dollars, I’d give her credit for being self-made. There’s a sizable gap between the Kardashian’s success and Honey Boo Boo. One of the benefits of having been blogging since before Kim K debuted on The Simple Life is that I have a history of articles that most cover inane stuff. One of them was the phenomenon of an internet marketer named ShoeMoney. Back in 2010, ShoeMoney wrote an article about he built a million dollar product without Google. The product was The ShoeMoney System. In 2010, I wrote that I’m not a fan of internet marketers. The reason why is that The ShoeMoney System was significantly promoted on the very popular ShoeMoney blog (which was in Google). It was also listed as a million dollars in revenue, not profit, which can be two very different things. Today ShoeMoneySystem.com redirects to a blog post no ShoeMoney.com that has been taken down and gives and error. That’s the million dollar business. Obviously, Kylie’s make-up business has a lot more staying power. I only want to compare the two, because neither seems to be self-made. Instead it seems to be a product of significant promotion from another source. I’d say there are four (maybe more) reasons behind Kylie’s success… and three of them shouldn’t be credited to Kylie. It’s hard to make a case for being self-made if someone else can take credit for all your success. It’s worth noting that Rob Kardashian is worth an estimated $10 million. So if you want to make an argument that Kylie’s a self-made billionaire, I think you also have to make a case that Rob Kardashian put together his $10 million fortune himself. For some reason, I don’t see anyone making that case. Even Jenner appeared to be aware that she isn’t fully self-made, telling Forbes Tuesday that her success was due in part to her existing influence. It’s not that Zuckerberg invented all of social media, but Facebook (and Instagram of course) is the biggest platform by far. And Kylie Jenner is the highest paid Instagram influencer. They are estimated to be worth a million dollars each. If she makes a thousand Instagram posts, that’s a billion dollars without the need of a make-up company at all. Obviously Jenner deserves significant credit for developing and cultivating such a strong social media presence. We just have to acknowledge, as she did herself, that “it’s the power of [the] social media” tool and family fame. I wanted to learn a little more about Kylie Jenner’s make-up line. I was curious if she was really spending time in the garage testing out the formulas and refining the ingredients. [Seed Beauty] would become a true partner of its brands, adding capital, brand incubation, and fulfillment to its hands-on offerings. ‘Brand incubation’, Laura explains, is a level up from the traditional celebrity brand and manufacturer relationship. White label or private label, as these arrangements are often referred, are largely transactional. Don’t call Seed Beauty ‘white label’. The company is working hand in hand with brands to grow them from the ground up. Does that sound like Kylie Jenner’s self-made business? That article about Seed Beauty had a lot more to say than what I quoted in the last section. It said that Jenner plays a very active role in the business. It’s clear that she’s involved in all the decisions and that she isn’t just slapping her name on a product. Importantly, Jenner set this all in motion by seeking out Seed Beauty and pitching them. There’s a phrase that underpins my entire website, “Work smarter, not harder.” It’s clear to see that Kylie has worked smart. I don’t know enough to say whether she’s worked hard. From my position on the outside, it doesn’t appear like it. However, it’s not fair to make that assessment from a distance. The problem that I see with this list is that Kylie Jenner could be seen as either #4 or #5. The fortune or business that she inherited is the family’s entertainment empire and social capital that goes with it. She could also be seen as the #6 who hired Seed Beauty. One of the dangers here is that it looks like Kylie Jenner is in the middle. However, the first three categories are essentially the same to me. Also, I think we can agree that 99.999% (and many more 9s) of peole start in categories 8-10. Even the number of people in category 8 is pretty small compared to 9 and 10. You can think of it as a very short and very wide pyramid with a almost everyone at the bottom and Kylie arguably starting at the top (or so close to the top that it isn’t worth dissecting). I think this is one of those cases where it’s a combination of things. It isn’t like a bag of a billion dollars fell right into Jenner’s lap. However, she’s obviously been in a very unique environment that was essential to her success. She’s used that opportunity to multiply her fortune many, many times over. After nearly 1500 words, I think there’s still a lot more discussion to be had. Please don’t be shy and comment below. Recently, I saw the movies Deadpool and Deadpool 2. I had them on my list for awhile, but it’s rare for me to have the time to watch movies nowadays. I loved them. They seemed to be new and different. It’s going to be weird to see Detective Pikachu and not think of Deadpool when Pikachu is talking. In Deadpool 2 there’s a character, Domino, whose super power is being lucky. It’s easy to write a lucky character in a fictional movie. We know that’s not real life. However, I couldn’t help but think that my life has been about as close as you can get to Domino’s. That’s especially true when it comes to my credit history. I’ve always been responsible with credit and that’s not luck. However, there’s some amount of luck that plays into almost everything we do… and your credit is no different. With that in mind, I thought I’d highlight four circumstances that where life’s hidden hazards could cost you thousands in future interest payments on houses, cars, and insurance. After college I moved back home and lived with my mom for a year while I got a job and started to save a little money. Fortunately, one of my best friends from college practically dragged me into sharing an apartment with him. I was also fortunate that he was very fiscally responsible. Together we never missed a rent payment or even came close. Not only will a poor rental history with back due rent, damages, or constant late fees damage your credit, they will also play a huge role in keeping you from renting in the future. Back in those days that we were renting (nearly 20 years ago! ), you could write a check and count on having a few days before it was cashed. Nowadays, things seem to move faster almost instantly*. With debit cards and online banking, money ebbs and flows as quickly as you make and spend it. I can take a picture of a check and it is instantly deposited into my bank account. With that in mind, it’s extremely important to manage your accounts carefully and conscientiously. Fees for insufficient funds that are not paid may eventually make it to a collection agency who then reports it to the credit bureaus. It doesn’t happen often, but it can happen. I think most people would agree that healthcare and student loans are the biggest financial challenges for many today. For this, I wanted to just focus on medical bills. After all it’s not like we are close to fixing health care. We can do a lot of things to mitigate those bills. We can eat healthy and exercise. We can get appropriate insurance. However, sometimes health is just dumb luck. If the fates are against you, you may still end up with out-of-pocket expenses like co-pays and patient portions. You may be able to negotiate some of the expenses, but if you can’t pay the bills, they’ll get onto your credit report and damage your score. It’s not a bad idea to check your score with a free credit report after a few months following an incident just to make sure there aren’t any random bills still out there that may have been forgotten. Back when I almost died eating pizza the insurance and medical billing were pointing fingers at each other and the hospital threatened to send the bill to collections. I may have been lucky in escaping pizza death, but I was unlucky with the billing. Owed tax is one of those debts that just won’t go away, even with bankruptcy. You don’t want to find out that you owe the government money. While that can be stressful, I’ve heard the IRA will work with you on the payments. Make those payments and you don’t have to worry about a credit score hit. This is one area, where luck doesn’t really come into play. If you are fiscally responsible it you shouldn’t be surprised by a bill that’s too big. It’s easy to find articles improving your credit score. I even have on hacking your credit score. However, sometimes the best way to good credit is to avoiding the big pitfalls. * The exception to this rule is when I’m trying to cash the checks from my tenants. Those still seem to take forever to clear. When I started this blog a dozen years ago, I had a goal to create enough passive (or close to passive) income to match my wife’s military pension. She’s eligible to retire very early and I didn’t want to work another 20+ years to begin that next chapter of our lives. Life throws a lot of twists and turns at you over a dozen years. This blog became an actual source of passive-ish income. I added a dog sitting gig to that. We have some rental properties, which makes landlord another side gig for us. Even though some of these take up some time, I define them as alternative income, because they give me a great deal of work freedom. With the benefit of a dozen years of (mostly) a bull market, that extra money has grown well. I, like a vast majority of investors over that time, have been extremely fortunate that the stock market has done better than they probably could have imagined. I was also very fortunate that I grew up in a household that understood investing. It wasn’t a strange concept to me and I owned my first mutual fund shares somewhere around age 15 or 16. Not everyone has that kind of experience. However, Go Banking Rates has a great guide for first-time investors. I didn’t directly invest the side income… at least at first. Instead, I used some of the side income to live off of. That allowed me to direct more of my full-time income to a 401k. For many investors, beginning or expert, contributing to a 401k plan is a wise move. If the side gig allows you to contribute a lot at an early age it is a solid path to financial independence. If my company didn’t have a 401k, which was common with the types of software start-ups I worked for, I could have used that side gig money towards a solo 401k or a SEP-IRA. Eventually, I did start one of each of those accounts because I moved away from that full-time job with the 401k. I’ve reached the point where I’m looking beyond 401ks and other retirement investments. Business Insider has a good list of new apps, software, and programs that make it a breeze for novices to start investing in the stock market without needing a lot of money to do so. I personally use and recommend Robinhood. The reason I love it so much is that they don’t charge commissions to buy and sell stock. This makes it easy to diversify across a number of ETFs or mutual funds. Currently I like to invest 60% in stocks (40% of that in the US and 20% abroad), 30% in bonds, and 10% in real-estate investment trusts (REITs). It’s not going to weather a stock market downturn completely, but it should provide some safety while also offering growth. I know that side gigs can be a lot of work and it feels like everyone is already overworked nowadays. However, if you can fit in something on the side, it’s amazing what a difference a couple hundred dollars can make here and there. The words frugal and New York City are seldom seen together. It’s probably one of the most expensive cities in the world. Nonetheless, we wanted to take the kids to see the big apple. Driving from Rhode Island, it was a little more than 3 hours away. The drive was a bit of a long drive for the kids, but with tablets, it wasn’t too bad. Unfortunately, I didn’t do the best job of loading up the two tablets with movies. I might have to consider buying another Amazon Fire 10 to replace my old Nexus 7. It’s much easier to get movies on it. Travel – If it was just one of us traveling a train may have made sense. With the four of us, train tickets get expensive. We opted to drive and park at the hotel. It was $60 for the night, which comes to about $20 per person when you add in gas. Back in college people would take the Fung Wah bus from Boston to New York for around $10, but I think it had about a 70% crash rate. I don’t think it’s still around, but it isn’t worth it anyway. Hotel – This is going to be cheating a bit, but hear me out. My wife was able to get a government rate or deal by being a Marriott ranking member. However, the deal wasn’t a big savings. There were other hotel options for a similar price that maybe had a little less luxury or a slightly worse location. The biggest factor in getting a cheap price was that it was the middle of February. We lucked out and got great weather most of the time. Unfortunately, in our search for a dog friendly hotel, we didn’t realize that Marriott charges a $100 per stay pet fee. My wife said that when she was booking this was a hidden fee a few clicks away from the information that the hotel was pet-friendly. We were only staying one night, so this was a tremendous surcharge. Next time we’ll go with a Hilton that I think charges only $50. We might even be able to do better than that. The big draw for us to go to New York City was the Pokemon store. My kids are completely obsessed with everything Pokemon. I’d tell you how many episodes they’ve watched, but it’s embarrassing. Did you know there are almost twice as many Pokemon episodes than Simpson’s episodes? There’s a reason why it is the the highest grossing media franchise. It’s just a little shy of being as big as Star Wars and Harry Potter combined. There’s one lie in the previous paragraph… there’s no such thing as Pokemon store in New York City. It’s a Nintendo store with a section devoted to Pokemon. However, I believe it is the only Pokemon Center outside of Japan. The trip to Japan from Rhode Island isn’t something we are entertaining any time soon. 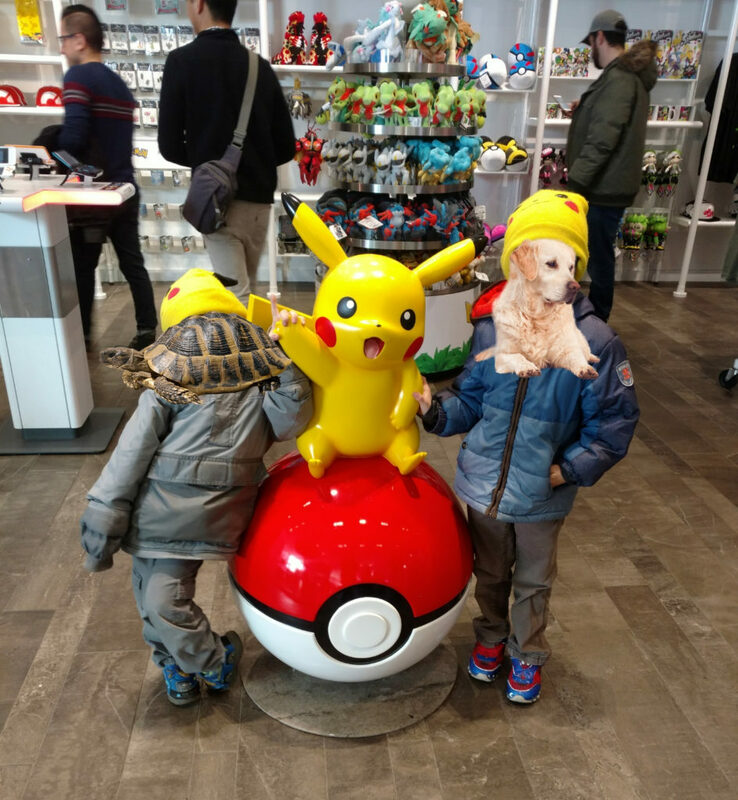 I wouldn’t have known there was a “Pokemon store” in NYC if my wife hadn’t stumbled upon it a last fall on one of her Broadway tours. She came back and reported that it was nearly a whole floor of Pokemon stuff. Sadly, on our trip the Pokemon stuff had been reduced to around 20′ x 20′ area. They didn’t have any of the popular Pokemon… not even a stuffed Pikachu. It took awhile, but eventually the kids warmed up to a couple of the options that they had. I’ll have to get my Magikarp some other time. Overall they were happy at a cost of around $30 or so. Next we went to FAO Schwarz. (Yes, it’s back in business.) The kids had a ton of fun in exploring all the stuff there. We spent hours there and they ended up only wanting to buy a couple of Kinder eggs for a few dollars. Compare that to Trolls’ Experience which was $30 a person for an hour show. We avoided that one. Another frugal win was Dylan’s Candy Bar. Three floors of candy is fun for any kid. While it might not strike people as frugal, it worked out relatively well for us. It was a slow evening so they took us in the cafe without reservations. Fortunately they were still having happy hour, which meant cheap appetizers and drinks. I hear it’s not uncommon to pay $15-$20 for a glass of wine in NYC. Our sour patch drinks (drinks with candy!) were $6 each. The kids mostly eat appetizers like mozzarella sticks and chicken tenders so it worked out. It was also helpful that we found that there were a lot of dollar a slice pizza places. The slices are quite big and four slices were enough for a late lunch for our family. Filling up on all that was key to avoiding the big ticket items at Dylan’s. The price of food and drinks at Dylan’s was $50. Factoring the pizza and lunch and dinner was under $60. We also stopped at the Lego store, but it was a disappointment as well. Some of the things that their artists built were amazing, but it was small and not really that much to do other than look at the few big things and buy Lego sets. The next morning my wife went to get some bagels to bring back to the hotel for breakfast. When in New York, you have to get some bagels. Unfortunately, they were surprisingly expensive. I think my wife said it came to around $20 for bagels and cream cheese. She said that next time it would have been cheaper to just get the cream cheese at the grocery store on the corner. One the bright side, the kids loved them and they were big enough for two meals. Throughout the stay, we filled in some of the other time with Pokemon Go. I’ve become quite attached to the game (I’m 2-3 years behind everyone else), especially since it’s something the kids share in. Pokemon Go is, of course, free and all the famous places in NYC means that there’s tons of stuff to do in the game no matter where you are. Next time we go to New York City, we’ll try to stay longer. I regret not having the time to coordinate a visit with a college friend. We’ll also bring the kids to museums, botanical gardens, and things like that. If there are any New Yorkers reading this who has tips for kids age 6, please drop me a comment. Despite the efforts to save money, we probably still spent close to $500 (especially with the dog hotel charge) for the day. I understand it’s hard to call that frugal, but it could have doubled if we decided to splurge at one of my wife’s favorite restaurants (Mastro’s) and did the Troll’s Experience. Frugal in New York City is definitely a relative concept. Do you have any tips for frugal activities in New York City? Let me know below. (You’ll earn 3,278 bonus points if they are friendly for kids in the 5-8 age range).